Ray Gun Steampunk prop replica. For decorative purposes only, NOT a real gun/blaster, removable from its stand. 5 1/2" long, Made of hand painted cold cast resin. Gentleman, does your good lady need her own protection? If sir, the answer is an indefatigable affirmative, then focus your attention on the C.O.D or Concealable Ossotronic Disruptor. Small enough to tuck away in a handbag, muff, sleeve, or garter, this trusty pocket pistol is simple enough to use for anyone. 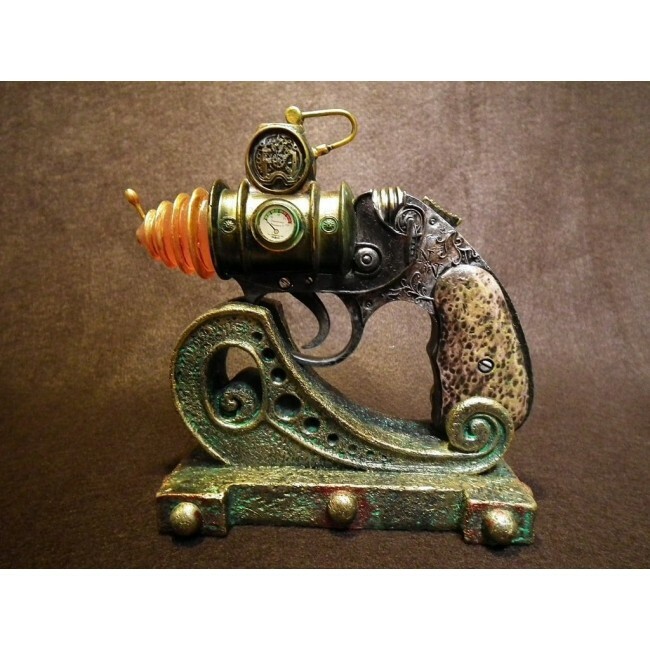 The C.O.D Blaster prop figurine is made of hand painted cold-cast resin and measures 5 3/4" inches long and comes with a beautifully matching stand in Steampunk style. Blaster is removable from its display stand. Intricately detailed, made of cold-cast resin and comes with matching stand. For decorative purposes only, NOT a real gun/blaster.) 726549083235	admin	base,marketplaces	Default	simple	0	Steampunk - Consolidator Ray Gun Prop with Stand	726549083235	Pacific Trading	PTR-8323	40325G	726549083235	B003UWINDG	Enabled	Catalog, Search	Taxable Goods	Toys	In Stock	30.99	10.50	29.50	32.99	3	1	Shop by Interest/Memorabilia/Pacific Trading , Shop by Interest/Novelty , Shop by Category/Toys & Games/Models & Replica , Shop by Category/Collectibles/Prop Replicas , Shop by Category/Collectibles/Steampunk	The world of reality has its limits, but the world of imagination is boundless. Let your imagination run wild with the Ray Gun Steampunk prop replica. Makes an excellent costume piece. For decorative purposes only, NOT a real gun/blaster, no active functions. Ray Gun is removable from its stand. 5 1/2 long, Made of hand painted cold cast resin.